Operating within the narrow confines of their distinctive sound, Disturbed deliver a generally satisfying third album. There is plenty to admire in Ten Thousand Fists, although the good material comes in a bloated package that is too long and therefore inevitably carrying a certain amount of deadweight. 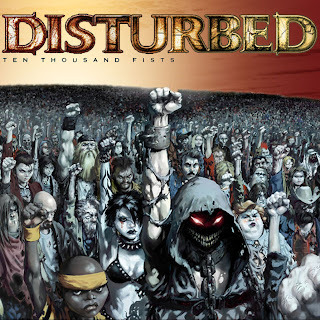 Disturbed may argue that the three year gap between Believe in 2002 and Ten Thousand Fists in 2005 justifies the inclusion of 14 tracks on the latter, but the counterargument is that few, if any, bands can come up with 14 tracks worth listening to in any one release, and Disturbed are no exception. Disturbed's strength and weakness is the predetermined sound that they carry into every song. The moderate pacing, crunchy guitars, thunderous traditional drums, solid but unspectacular structures, few and far-between solos, and David Draiman's dominating and just slightly gravelly vocals are the columns on which every track is built, and when the ingredients mix well, as they often do, Disturbed are enjoyable. The album starts out with a bang, title track Ten Thousand Fists shamelessly aiming to be a most unapologetic fist-pumping anthem, and succeeding in spectacular fashion, thanks to booming drum work from Mike Wengren and Don Donegan's guitar imposing itself without the need for showy solos. Deify is the other terrific track on the CD, Draiman and Wengren combining on a dominating chorus that comes at the peak of a thick-steel structure. Many other tracks are highly enjoyable. Stricken is all about the power and range in Draiman's voice, highlighting his trademark rapid-fire delivery, and half-way through the track is a most welcome and lyrical guitar solo. Forgiven is just pure fun, the band creating a forboding wall of sound, Donegan's guitar and Wengren's drums combining to build a massive canvass for Draiman to garnish. And almost out of the blue, the admirable cover of the Genesis hit Land Of Confusion demonstrates no small amount of innovation, and hints at what Disturbed can do when they stretch just a bit. Just Stop and Sons Of Plunder are the other notable tracks, but the album does go on, and instead of leaving the fans wanting more, the more likely reaction by the time the 14th track rolls around is "enough already!". Ten Thousand Fists solidifies Disturbed's standing as defenders of metal's ethic, and although their formula is generally predictable, it does have an impressive yield. Produced by Johnny K. and Disturbed. Mixed by Ben Grosse. Mastered by Ted Jensen.